The ultimate in consumer Artificial Life, Creatures 3 creates Norns, Grendels and Ettins that behave as though they are alive, because they almost are! The Norns think for themselves using a genetically specified brain and advanced biochemistry - a technology that has been substantially improved for Creatures 3 as a direct result of exciting new research. 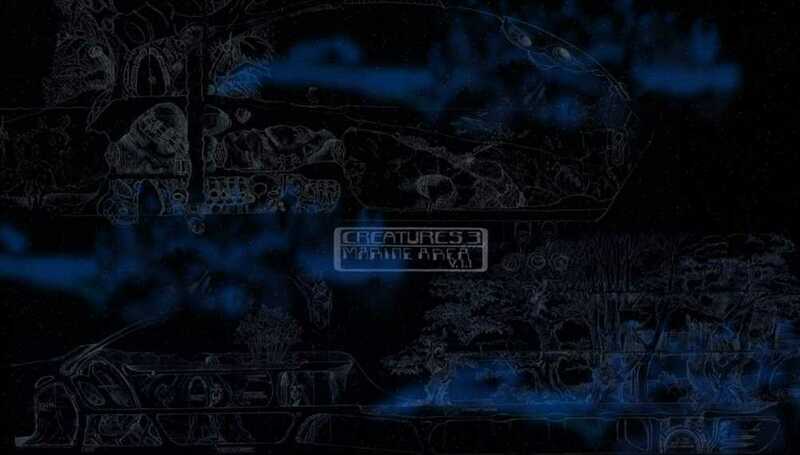 The creatures in Creatures 3 debut exciting new technological developments in the field of artificial organisms. These introduce social behaviour for the first time, as well as dramatically enhancing the creature's sense of direction and overall brain power. New to Creatures 3 are connecting agents that allow you to build your own gadgets, even super-machinery. Like a vast Lego set of cool gadgets that you can just plug together in any way that you like, Creatures 3's connecting agents allow you to make all manner of machinery. You could make a machine that on detecting a Grendel, fires the sludge gun at him. Or you could even construct a vehicle with remote cameras that can be controlled from the bridge and is able to scout areas in advance of going in. In the true Hollywood style of prequels, Creatures 3 explains the mystery of the ancient civilization of Shee and where they went after leaving the disk-shaped Albia of Creatures 1 and 2. Creatures 3 is set a millennium before Creatures 2 when the Shee left the disk world of Albia in a huge living spaceship to find a new, more spherical home. When the stow-away Grendels attacked them in flight, the Shee escaped to the planet's surface and abandoned the spaceship in orbit. The massive Shee spacecraft contains a variety of worlds, including a warm and comfy terrarium world for the Norns, a vast desert world, a dangerous jungle and much more. The craft is home to the lovable and intelligent Norns who need protecting from the vicious Grendels who have a acquired a particular taste for Norn eggs. Also on board are mischievous Ettins who tend to pick up odd bits of equipment and carry it off to their own desert world aboard the ship. Still recalling the wise teachings of the ancient Shee, who only recently abandoned the spacecraft, these Norns have greater intelligence than those from Creatures 2. From the spacecraft's bridge, they have access to a wide array of machinery and gadgets with which to ward off the Grendels but they need your help.